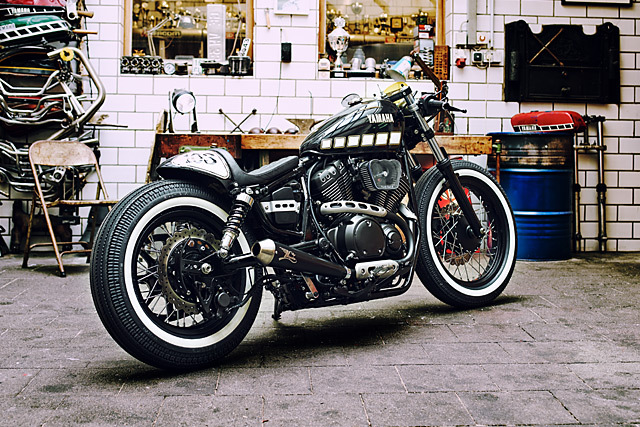 Dirk Oehlerking of Kingston Customs is an elite motorcycle builder known for his clean, stylish creations with small design details you won’t find anywhere else and a pursuit of perfection that is largely unrivalled. So when Shun Miyazawa, the Product Manager at Yamaha Europe and also the man behind Yamaha Yard Built program, was looking for his next builder he knew he had just the man. 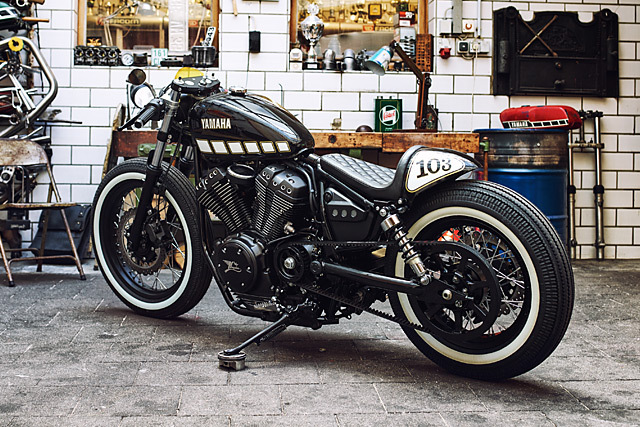 Thrown the keys to a new XV950 Bolt from Yamaha’s Sports Heritage range, the idea was for Dirk to create a custom classic like nothing else in the Yard Built stable that would inspire fans around the globe and bring to life a new parts catalogue any XV950 owner could add to their own custom creation. 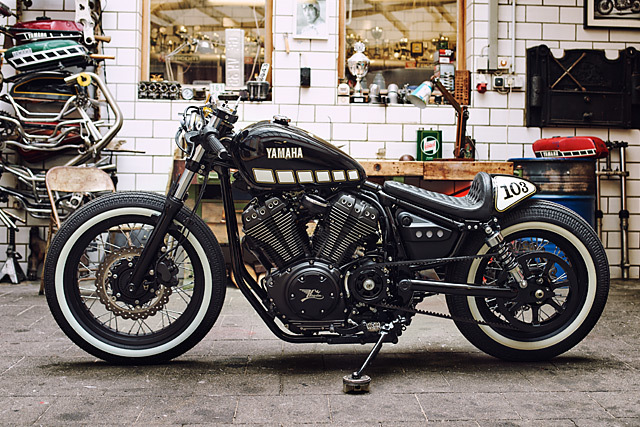 Welcome to Yard Built team Kingston Customs Café Bob XV950, a tough road warrior known simply as “The Face”. 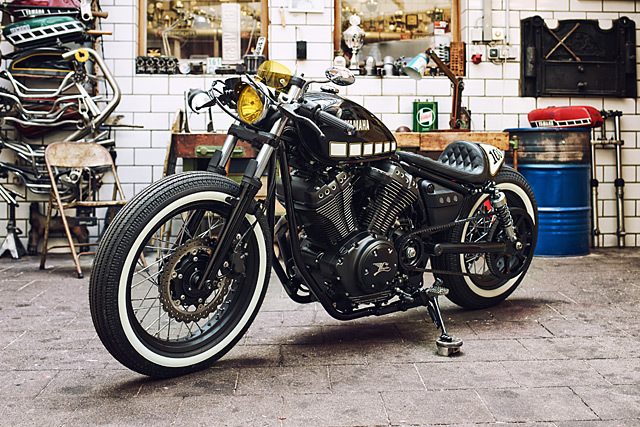 The XV950 lends itself perfectly to the style of the Café Bob that Dirk had envisioned and his execution is on point in every manner drawing on elements from both styles to create a seamless design. The seat pan is the perfect example. 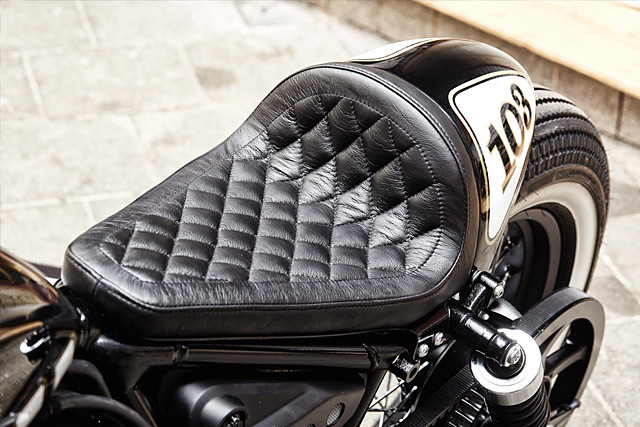 Designed and built in-house, it has a café styled hump, with bobber like tyre hugging fit, old school back bone flow and a beautifully stitched leather seat. This is one of the parts Kingston Customs will offer for sale and no cutting of the frame is required, in fact all you need is one M5 Allen key and its job done, genius! With the seat acting as a rear fender and no front fender the only other “tin” is the stock tank. Both are painted in a rich gloss black for a tough look with Yamaha’s famous speed block design on the tank and a racing number on the tail. Where the large pieces have been kept simple and stylish the other visual features are clever creations that gives the XV a distinctive Kingston Customs feel. The small yellow-lensed headlight proves less is more while providing ample room for the yellow MX visor that acts as a small screen. The triple trees are remarkably clean for a modern motorcycle but given a unique touch with a spark plug mounted into the stem nut and valve caps fitted to the top of the forks. This minimalism continues throughout the build allowing the key features to take centre stage, like the exposed belt at the gearbox that gives the Yamaha the subtle appearance of having an open primary drive. The custom touches continue with Yamaha factory parts working with Dirk’s own creations to further individualise the look of “The Face”. Kingston Customs fabricated brackets support Yamaha YZ dirk bike footpegs, some of the only raw metal on the whole build, while Dirk crafted foot controls for both the brake and gearshift from scratch. 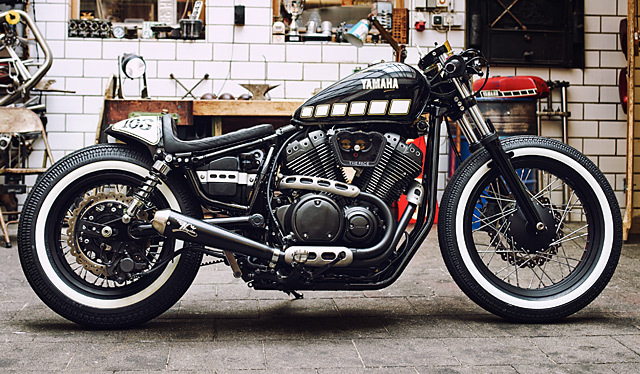 It is the clever use of mid controls on the XV950 by Yamaha that enable builders to create a range of styles without having to take drastic measures. The LSL clip-ons mounted down the forks give the machine a low café look without compromising its bobber qualities in any way and hold the factory switchblocks and Motogadget grips. The speedo is nicely hidden to keep the lines clean and is a fully functional Motogadget unit mounted on Dirk’s own bracket that provides all the information of the standard cluster in one neat package. Over the years certain manufacturers have become complacent with the internal designs of their V-twin offerings, not Yamaha. The XV950 features Yamaha’s 942cc version of the V configuration with state of the art 4 valve cylinder heads, multi-directional spray injectors and pent roof combustion chambers that deliver maximum volumetric efficiency that results in handfuls of useable torque throughout the rev range. Not only does it make for a great ride it also means you get maximum reward for your bolt on modifications. Dirk took advantage, ditching the standard can and fitting a classic look reverse cone muffler in black that elicits the meaty V-twin sound and delivers a few extra ponies. 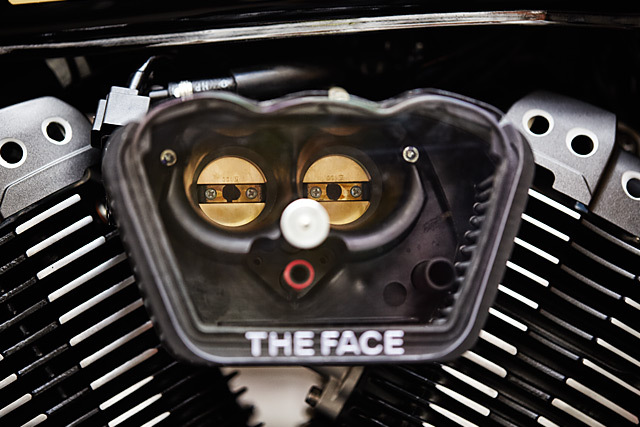 On the inlet side the Dual bore, 35mm throttle body is exposed with the ultra cool see-through ‘The Face’ style air filter cover and even more mechanical workings are exposed with the counter sunk holes drilled into the valve covers. 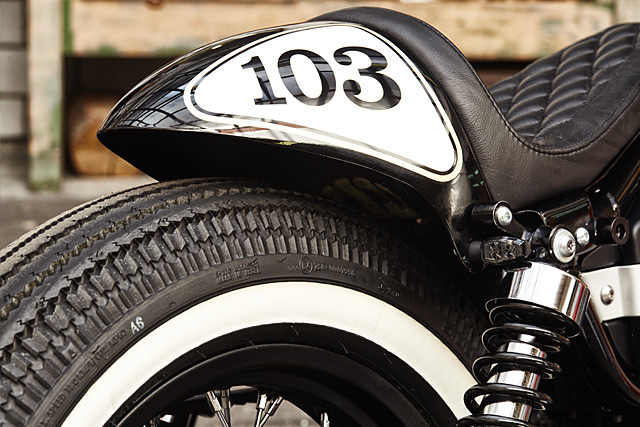 The choice of wire wheels are a perfect selection for a Café Bob as they feature heavily in both styles while the chunky vintage styled Shinko rubber with white walls works wonderfully with the white in the paint scheme. This is a machine that is well thought out and executed exceptionally, Dirk lets the features he wants you to see make a statement while required items blend into the overall design. You’d hardly notice the bar end indicators until they are illuminated and that is exactly the point. While Highsider items do the same job out back, mounted just below the shock mounts, its road legal function with show quality finish. The suspension while not featuring big dollar componentry is modified by Kingston Customs for just the right look, the front end lowered and the bottom line of the tank remains perfectly parallel to the ground. It’s one thing to be able to hack up a frame, change tanks and utilise an enormous budget to throw big dollar components at a build; But when one of the leading manufacturers in the world calls on you to create a high level custom with parts their customers will be able to bolt on the challenge is arguably far greater. 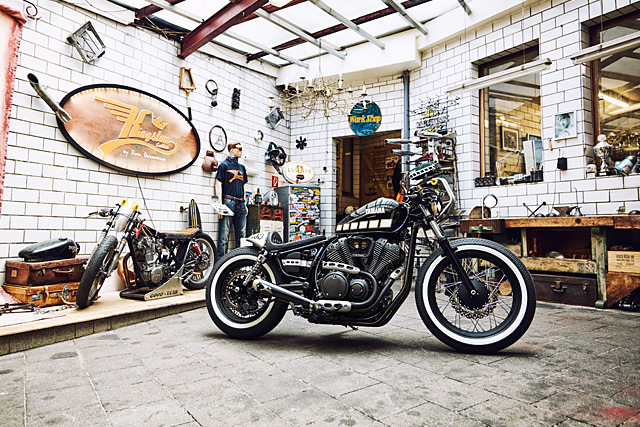 And Dirk of Kingston Customs has more than stepped up to the plate, he has joined a handful of the world’s best builders in creating a masterpiece for the masses and continuing the phenomenal success of Yamaha’s Yard Built program.